In English, and Spanish, with subtitles. 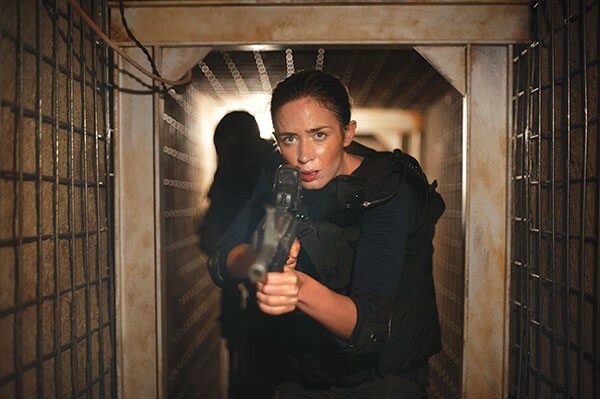 FBI agent Kate Macer (Emily Blunt) joins a task force that is chasing a major Mexican drug-cartel leader. From the outset, the by-the-book Macer is troubled by the group’s fuzzy mission, and the two cavalier men who control it: Graver (Josh Brolin), who claims to be from Defense, and Alejandro (Benecio Del Toro), a Colombian. But Macer wants a win in this never-ending drug war, so she goes along, even as the mission increasingly compromises her code. Denis Villeneuve’s Sicario is a taut, dread-filled thriller that succeeds by hewing closely to a relatively simple story about a complex situation. (Late in the film, there’s a detour from Macer’s perspective that’s not so smoothly integrated.) The moody vibe is helped immensely by top-notch cinematography by Roger Deakins — from nervy night-vision-scope to sweeping aerial shots over desolate deserts and crowded cities (topographies that are also characters in the greater narrative) — and an electronic-music score by Jóhann Jóhannsson.